Since it is such a nice Fall day at home, I thought I’d feature “L’Automne dans le jardin” today. 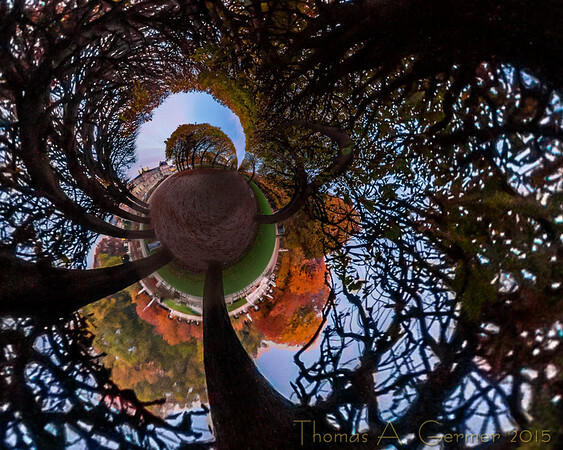 This panorama was taken in the early morning at the Gardens of Luxembourg (Jardin du Luxembourg) in Paris a few weeks ago. 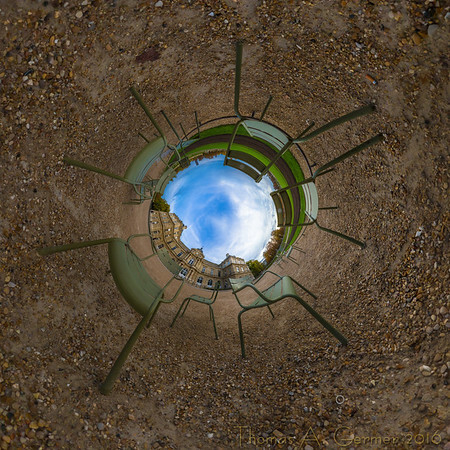 I show the flattened cube proof for the cubic panoramic sculpture, as well as two stereographic projections. Anyone who has been to Paris will come to realize that many of the gardens and parks provide chairs for people to relax in. On a nice afternoon, the chairs are filled with people relaxing in the sun. “Chairs at Luxembourg” was taken long before the crowds emerged. 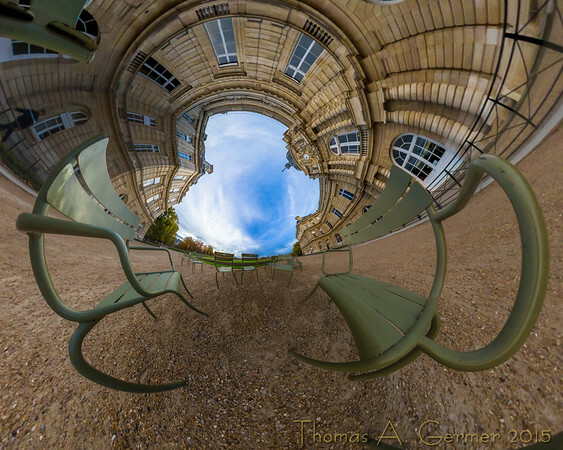 While at the Jardin du Luxembourg, I saw all these chairs and wanted to capture their presence. 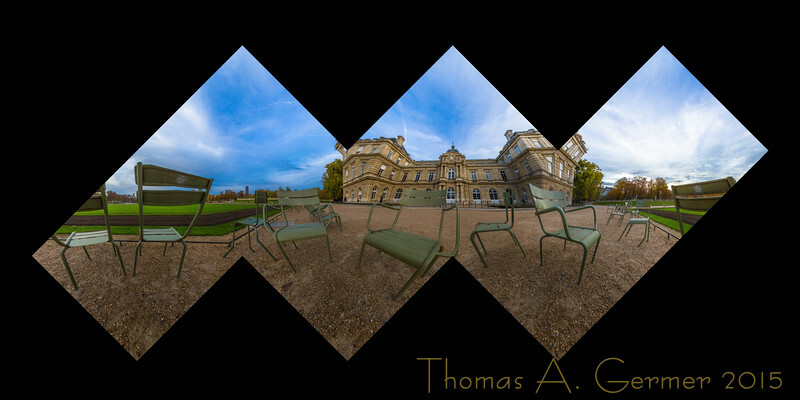 I opened up the tripod, so I could get low to the ground, situating the chairs above the horizon, and shot the series for this panorama. I returned this past weekend from another three week trip to Paris. On the second Saturday, I woke up very early, about 5 a.m., took the RER B line to Châtelet-Les Halles, then the RER A line to Charles de Gaulle Étoile. 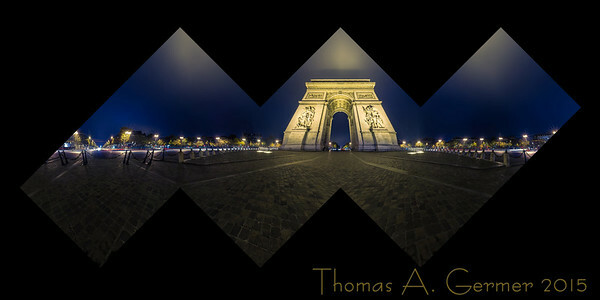 It was still very dark when I arrived above ground and the Arc de Triomphe was lit up at the center of the large traffic circle, l’Étoile. 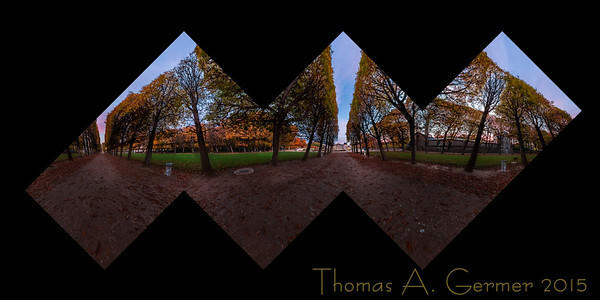 On a previous trip, I had scoped out a place to shoot a panorama, the center median at the end of the Avenue des Champs-Élysées. But, when I arrived, I realized that the median was not raised at all, making me wonder what would keep a driver from trying to cut the corner a little short, hitting me. The tunnel access to the Arc de Triomphe does not open until much later, so to get on the center island required crossing several lanes of traffic. So, I stood and waited, studied the traffic patterns, when the traffic was heavy and when there were pauses. I saw two guys run across the lanes, screaming at the top of their lungs as they did, so I was confident that I could do it. And, I did. 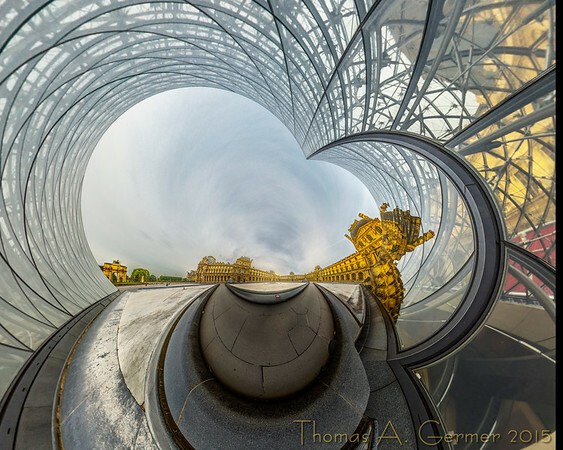 I shot two panoramas, the one I show here, which is centered on the archway and on the side of the Champs-Élysées, and another closer and not centered on the archway but with a better view of the eternal flame of the Tomb of the Unknown Soldier. The exposure for each shot was long, 30 s, so that the lights from cars and trucks leave long trails. It was a somewhat misty morning, too, so the lights illuminating the monument light up the sky above it, and there is a shadow of the monument in the mist. Every year, on 11 November, the anniversary of the Armistice, there is a ceremony here to honor the soldier in the tomb. So, it seems fitting to post this picture today. I show the proof of the cube sculpture along with two stereographic projections. 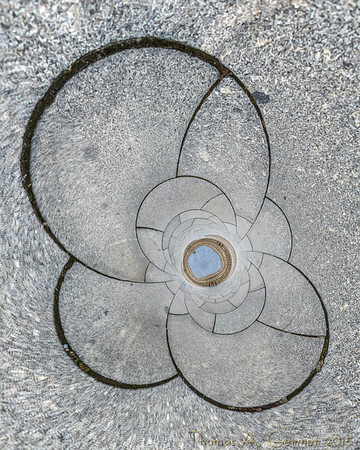 You can click on any of the images to see other projections as well. 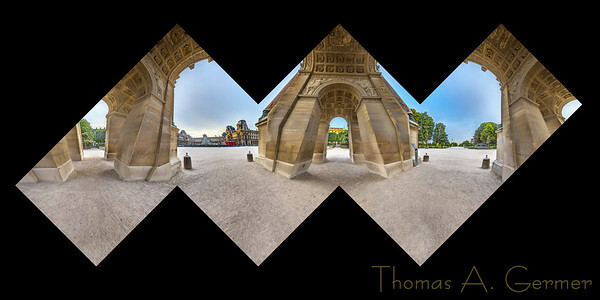 Finally, the last panorama from my July 2015 trip to Paris! 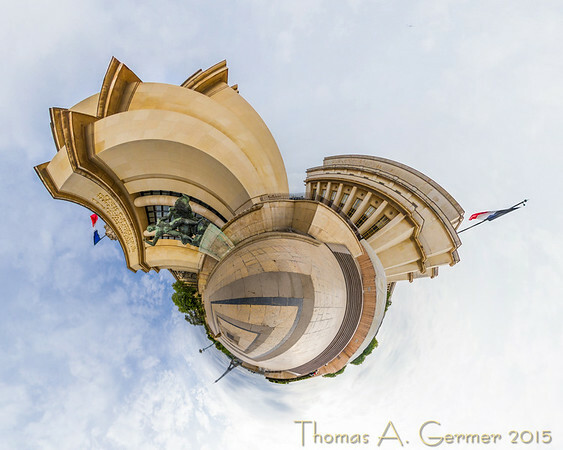 This one was taken outside the Musée national de la Marine (National Navy Museum) from here. First, I show the flattened proof of the cube. 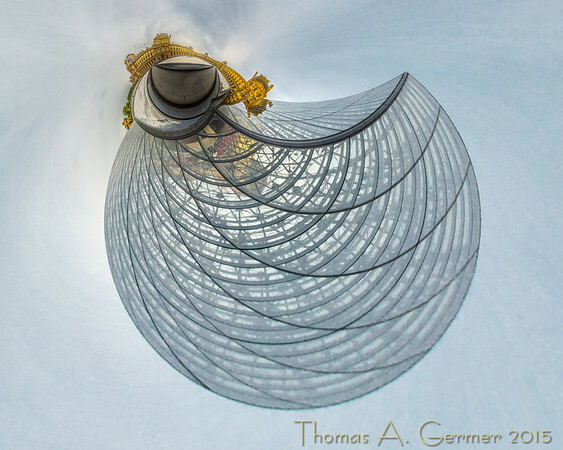 Following that are two stereographic projections. If you click on any of the images, you will be taken to the full gallery on my website. I will take a break here and prepare for my next trip. I’ll be back soon! 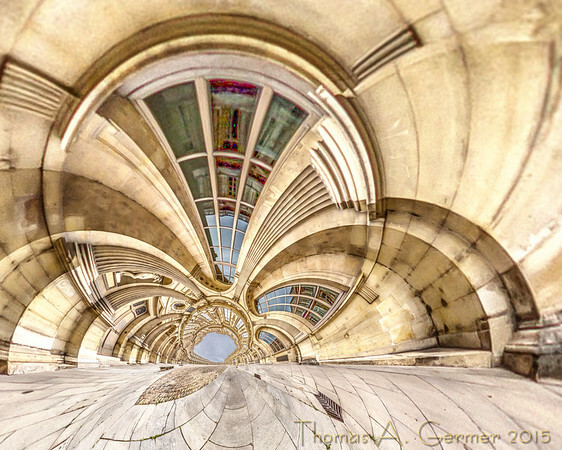 This series was taken under the Arc de Triomphe du Carrousel, a small triumphal arch near the Louvre. Next: One last panorama from my July trip. 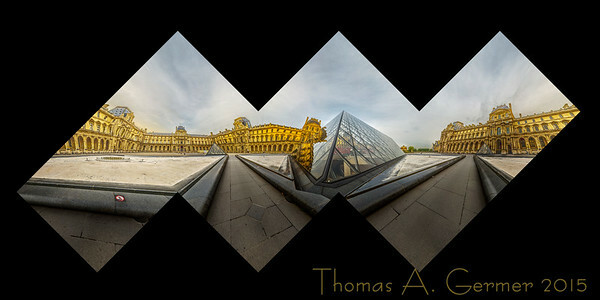 Here is another panorama taken in the main courtyard of the Louvre, shot here. 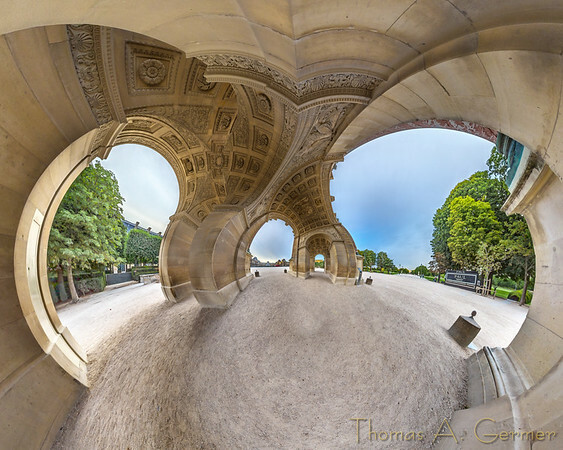 Next: the Arc de Triomphe du Carrousel. So, after shooting yesterday’s post, I saw someone slip around the security fencing, and I followed suit. With almost no one hanging around the pyramid, I went to its corner and shot this series. The fountains were dry. I think it would have been more spectacular with the fountains going. If there were at least water in them, there would have been reflections in the water. 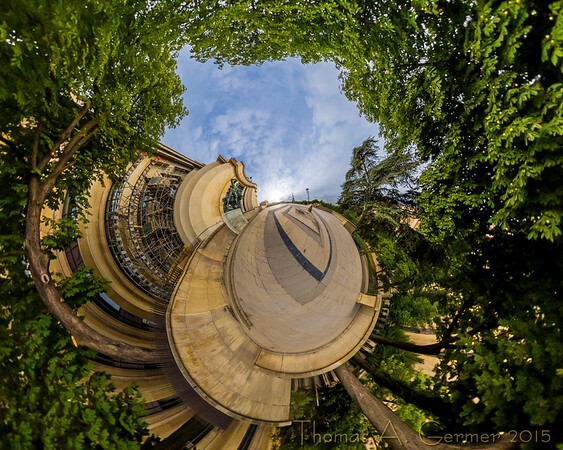 Coming next: a series with the same plaza, taken near the entrance to the Cour Carrée. 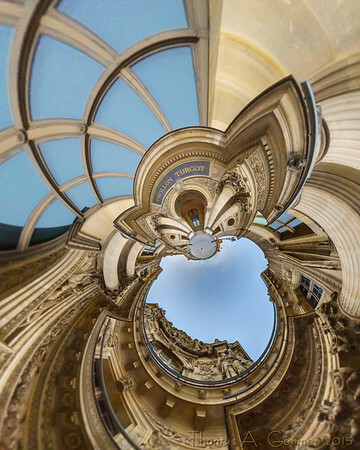 It just occurred to me that I could post the nearly exact locations of my panoramas. 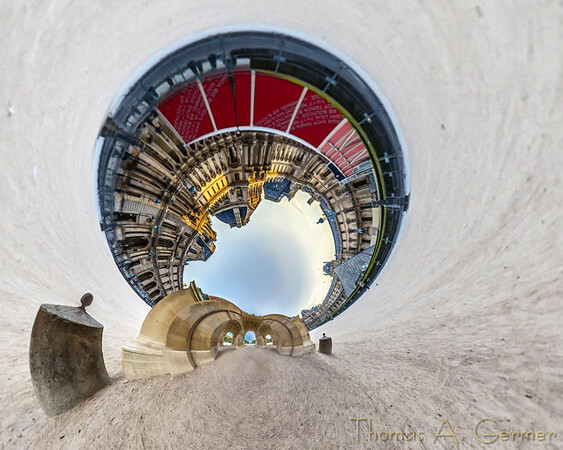 The panorama featured today was taken just outside the Louvre. There were crowd control gates “preventing” people from entering the square with I.M. Pei’s pyramid, but I was a little reluctant to jump them at first. So, while I waited for the museum to open, or to build the courage to sidestep the gates, I took this series. First, I show the flattened proof of the cube. 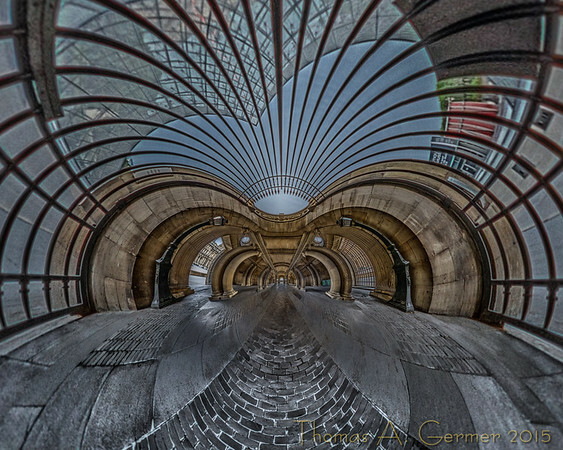 Following that are two stereographic projections. If you click on any of the images, you will be taken to the full gallery on http://www.tagermer.com. Coming next: a series taken next to the pyramid. 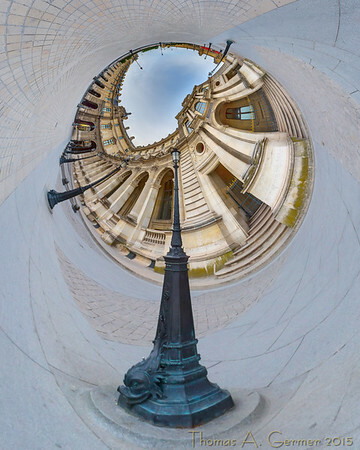 The Cour Carrée (Square Court) of the Louvre is a large enclosed square. 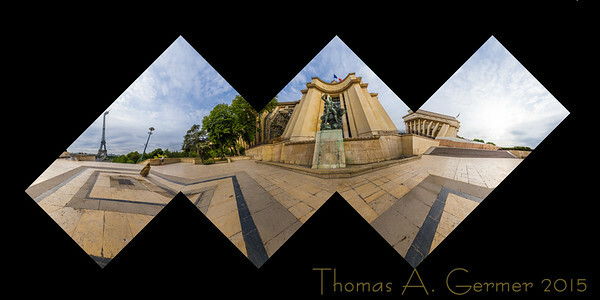 I shot two panoramas from within this space, the first taken near one of the corners and one taken near the center. Both are shown here. 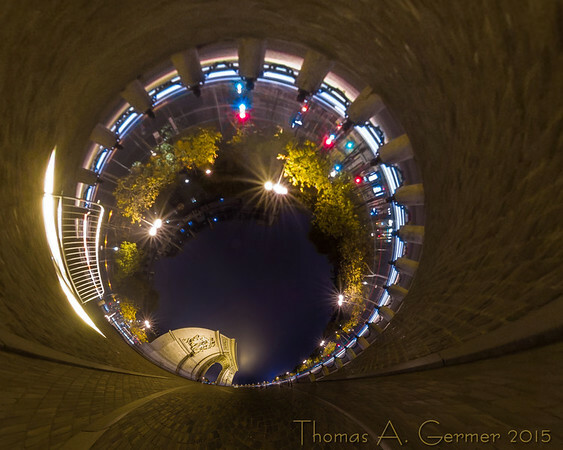 I prefer the one taken at the corner, because the nearness of the corner breaks the otherwise monotonous symmetry. I show two flattened cubes, proofs for cubic photographic sculptures. 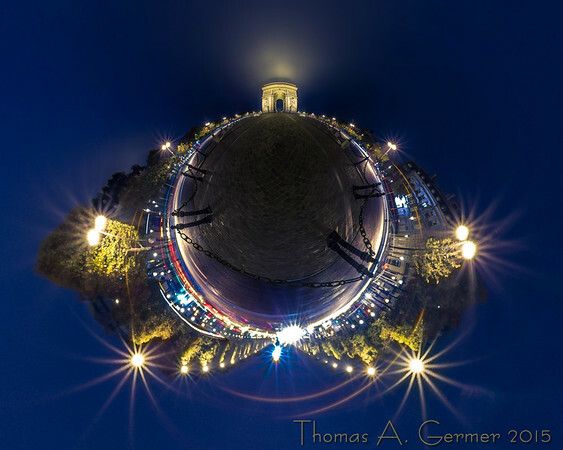 I also show two stereographic projections, one taken from each of the panoramas. Click on any of the images, and you will be directed to a gallery showing all of the images. 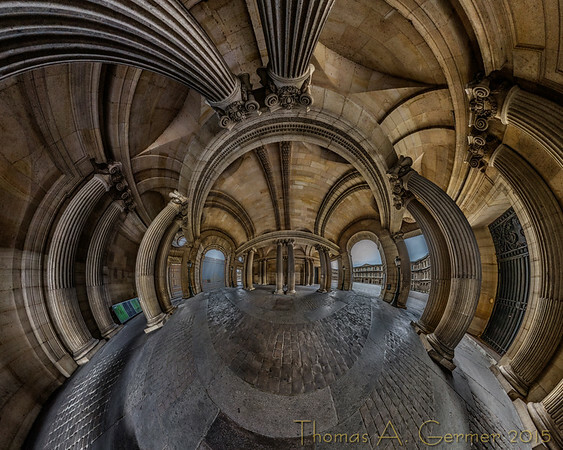 This stereographic projection is a tunnel view, looking straight up, but the marble tiling on the ground dominates the image. 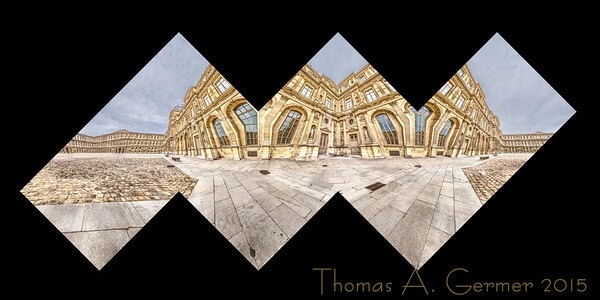 The Cour Carrée (Square Court) of the Louvre is a large enclosed square. I wanted to get into it after shooting some pictures in the main plaza and had to wait until 9 a.m. for the gates to open. 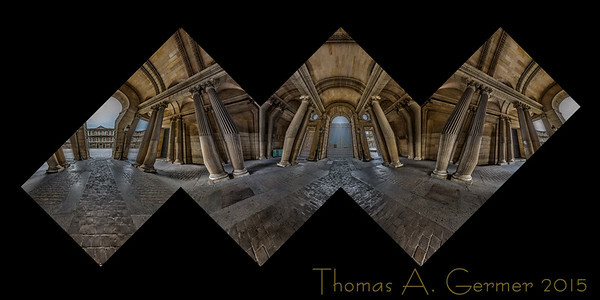 The first person into the gate, I immediately shot a panorama from the passageway, shown here. You can see the I.M. 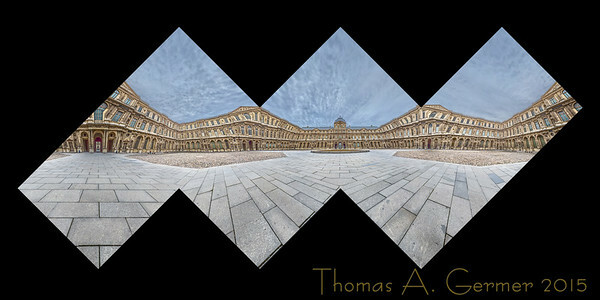 Pei pyramid through the gate on one side and the Cour Carrée on the other. As usual, I show the flattened cube, a proof for the cubic photographic sculpture. 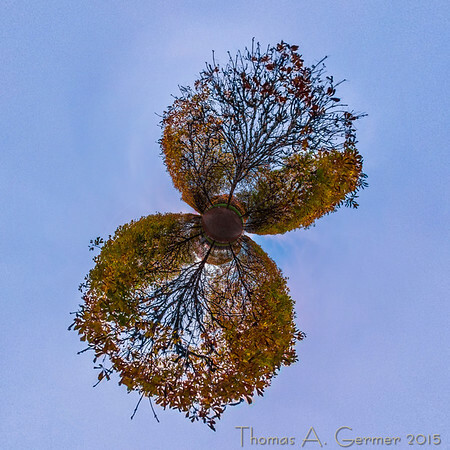 I also show two stereographic projections. Click on any of the images, and you will be directed to a gallery showing all of the images. 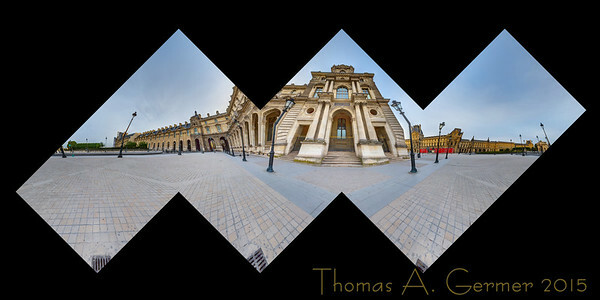 Next up: Panoramas from inside the Cour Carrée.